When you arrive for your theory test, your documentation will be checked first. For registration you will need your Provisional Driving Licence (photo card only since 8th June 2015). You will then be taken to a test room where the computer will display your name and the category of test you're taking. Before the test starts you will find instructions on how to use the computer. Don't worry you can choose to do a 15 minute practise run of the multiple choice questions so you can get used to how it works. After this the actual test will start. In total 57 minutes are allowed for the test and you will need to get at least 43 out of 50 correct to pass the test. 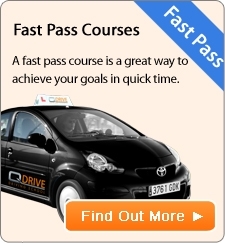 Start Practicing Your Theory Test NOW Free! Watch the Official DSA car theory test - are you ready? The Hazard perception test is made up of 14 video clips in which 15 hazards must be identified. The earlier the hazard is identified the more marks will be scored. The most that can be scored for each developing hazard is five points. To pass this part of the test you will need to get at least 44 out of 75 correct. You'll need to pass both parts to successfully complete your theory test. If you pass one part and fail the other, you will fail the whole test, and will have to take both parts again. Albanian, Arabic, Bengali, Cantonese, Dari, Farsi, Gujarati, Hindi, Kashmiri, Kurdish, Mirpuri, Polish, Portuguese, Punjabi, Pushto, Spanish, Tamil, Turkish, Urdu, Welsh. Only English language is available. The UK driving theory test is changing from January 2012. New theory tests will be introduced using all new questions that will not be published for the public. To find out more and to keep updated visit the Q Drive Blog.